One of the more well-known web building companies, GoDaddy offers a store package separate from their website builder that's targeted specifically to business owners looking to put together a DIY eCommerce platform. That targeted focus results in a system that's remarkably simple to use yet still features a full range of online store options such as coupons and promotional tools. A few features are left in the wayside, however, with more limited design options. Unlike most store builders, it's not a drag-and-drop style or What You See Is What You Get editor, but changes are made almost completely by filling out fields, which has the advantage of being simpler and less time consuming. GoDaddy's Online Store builder is an excellent fit for exactly who the product is designed for: busy business owners that want to focus solely on the business side of things for their online store. GoDaddy is currently offering a free one month trial of their online store. Unlike the other platforms we've tested however, the store doesn't simply expire after the trial. Payment information is required at sign-up—if you don't cancel before the first month is over, you'll be automatically charged the $29.99 a month fee. This makes the sign-up process take longer than most. Once new users input payment information and their basic business info, the Getting Started Guide appears. The guide is quite handy, with a list of steps that appear faded once you've already accomplished them, and the option to get your store live at the end of the list. Those who prefer to forge ahead without a guide can choose to skip it and use the navigation bar at the top. Products are at the priority in the GoDaddy store system, and it shows. Products can be added with the Getting Started Guide or under the Products tab at the top. The available options to include with a product hits every mark, and then some. There's the expected options like name, price, sale price, description and category, but unlike most other eCommerce platforms, there's also a customization option for extras like engraving or monogramming. The customization field can be required or optional, and the price can be increased when customers select this option. Store owners can also opt to customize the title and description that will appear in search results. The GoDaddy online store also gives store owners the option to use the platform to track their inventory. Input the number of available items when adding the product, then the system keeps track whenever a customer orders online. Once the inventory number reaches zero, store owners can choose to either allow backordering or prevent any new orders. Payments can be accepted using PayPal or Stripe. Users can customize their tax options, as well as choosing to use flat rate, weight-based or free shipping. The GoDaddy online store platform is template-based, with about 15 options to choose from. The templates are well-designed and modern, with a variety of styles, though we've certainly seen more options from other web builders. Templates can be modified with your own business logo, images and colors, though there are fewer customization options than the GoDaddy Website Builder. By keeping the platform simple, GoDaddy has eliminated some of the design options. Most users will appreciate the simplicity, though a few may wish for a wider variety of options. For example, users can't drag and drop items to rearrange a page or adjust the template. While the designs are somewhat limited, GoDaddy does include the option to use HTML code in the store header or footer. The storefront can also be linked to Google Analytics to monitor traffic and rankings. Unfortunately, there isn't a way to seamlessly integrate a GoDaddy store with their website builder. The link to the store can be added to the navigation on any website, but visitors will be taken to a new site and will probably notice the change in design. Pages can be added directly to the store, however, so some users may not even need a separate website builder. The page options are much more limited in the store with just a header, page content and Google search options, but will work for some businesses. The GoDaddy online store doesn't stop at just creating a platform for businesses to sell products—they help with a few marketing options too. A Facebook store is included in the package and social media buttons can be added to pages and products as well. Customer reviews can also be included using a Yot Pro widget, something, again, not every storefront creator includes. Coupons are included too. Business owners can create their own coupon codes for either a percentage off or a dollar amount off an order, as well as limiting the number of uses and adding requirements like order minimums. The GoDaddy Online Store is designed to be a no-fuss platform for businesses to create a DIY internet ordering platform. It clearly excels at that, though in order to keep everything simple cuts back on the design and customization options. We would've liked to see a better way to integrate the storefront with the website builder, for example keeping visitors on the same page and allowing for options like adding a blog (which is possible in the GoDaddy web builder, but not in the storefront). When users get stuck (which shouldn't happen often with the simplicity of the system), the help system is excellent. Known issues are listed right in the Help center, so you won't waste time asking about a known issue that's already being worked on. Help is accessible through both phone or an online chat, both list an expected wait time and both seem quick to respond. 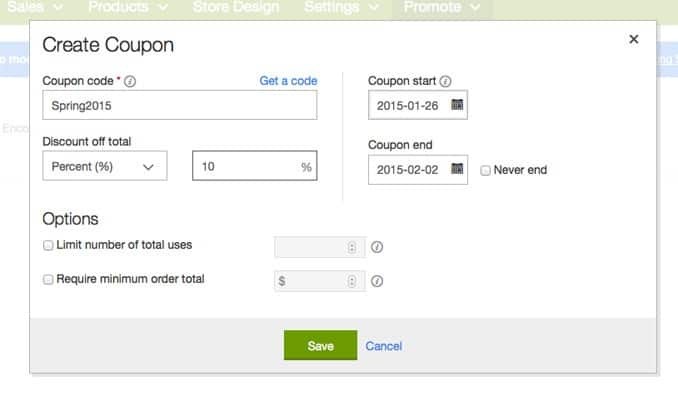 The GoDaddy online store builder sits at a $29.99 monthly price, but seems to include enough business features to justify that rate, including unlimited products, coupon codes, a Facebook store, hosting and more. The domain name is not included, however, and a .com will cost extra. While many platforms offer multiple packages at different prices, GoDaddy has one rate for their store. It's a good rate for their features, but smaller businesses who have fewer products and don't need as many features may find a better deal elsewhere. For business owners who want a simple, yet fully-featured online store, the GoDaddy platform certainly fits the bill. It nails the most important elements needed and contains the right features to sell products online easily and effectively.